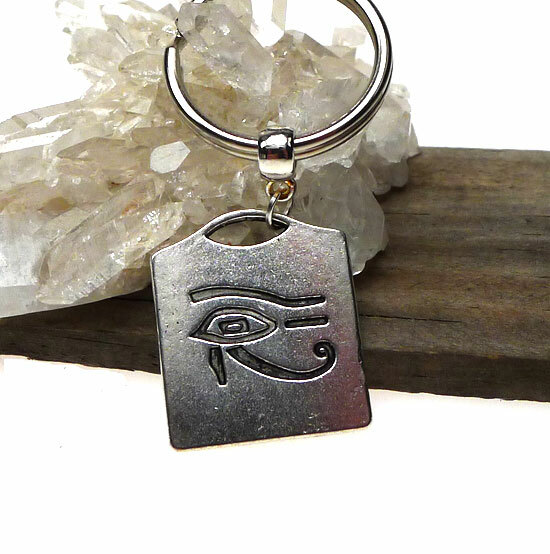 This silver Double Sided Eye of Horus Egyptian Keychain is made of Pewter with a finish resembling antiqued sterling silver. The Key Ring is the classic metal split ring and measures 1 inch or 25mm. 'Let the Eye of Horus come forth from the god and shine outside his mouth.' --The Pyramid Texts During his battle with Set to avenge the murder of his father, Osiris, Horus' eye was plucked out and torn apart. After his victory, the eye was pieced together by Thoth who added a small bit of magic to make up for the 1/64th of a piece that was missing. 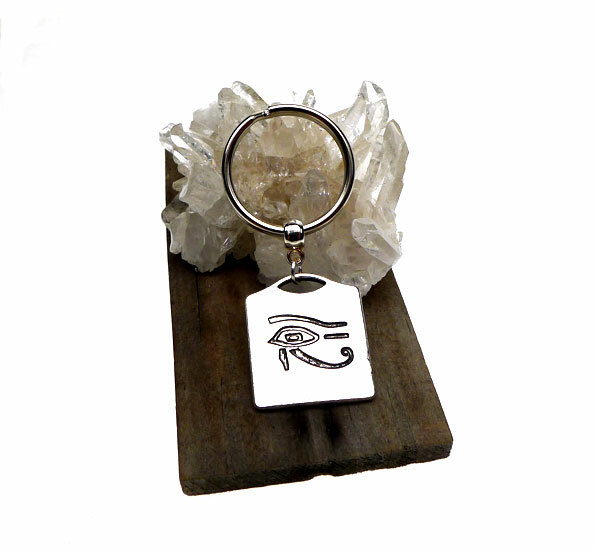 In ancient Egypt, it the symbol was a powerful amulet. The eye was painted on boats and other objects in need of divine protection. Jeweled copies of the eye were placed with the dead and painted on sarcophagi. The Eye of Horus was believed to have healing and protective power, and it was used as a mathematical device to prepare medications. The masonic all seeing eye, the eye symbol found on American money, and our modern Rx symbol are all derived from the Eye of Horus. The word utchat, sometimes spelled udjat, refers to Egypt's sacred eye symbol. The right eye is called the Eye of Ra, symbolizing the sun. The left is called the Eye of Thoth, symbolizing the moon. Both eyes together are the Two Eyes Of Horus The Elder. The eye is the part of the body able to perceive light, and is therefore the symbol for spiritual ability.